This term was introduced by Simon Goss to describe a phenomenon in ko fights: a ko threat may actually be played out as a pair of sente plays. 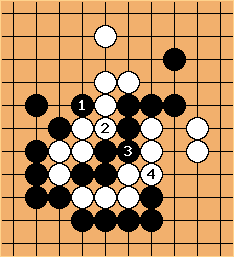 For example Black's threat may be a whole exchange - - - made in sente, before Black recaptures the ko. This will of course not be Black's normal way, if and can separately be used as ko threats. The usual reason will be that the position after is too 'hot' to leave - perhaps is atari and is locally required. It is conceivable that a long threat of this kind would also sometimes be played as a matter of ko threat amplification. to is an example of a long threat.